Leaving Kargicak after such a long stationary pause felt like leaving for the first time all over again. The preceding week was spent tying up loose ends, making preparations for the route and cold weather ahead, and speaking with friends and family over skype. I ate copious amounts of food from the buffet to indulge my taste buds and add a layer of insulation, fully aware that the mundane pasta and tuna rations would grow tiresome before long. When the day arrived, the last minute cram began by fitting the new tyre that had lay in my room for weeks, followed by an attempt to finish the entire breakfast buffet. I then waddled around my room suffering with an unhealthy dose of food sweats, whilst taking an age to get everything packed, through an underlying feeling of nervousness. It was after eleven o’clock by the time I managed to hoist a heavy leg over Surly Anne. The two of us creaked and groaned under the strain of our combined heaviest weight yet, bouncing off one another in an uncoordinated fashion akin to a drunken one night stand (so I’m told). The nervousness dissolved into concentration immediately, and, gradually, as a steady rhythm emerged, the adventure of travelling towards the unknown took hold. This was a ridiculously steep climb, I stopped purely to capture the picture, honest. I managed a respectable fifty-six miles on day one, stopping near Ìnalkoy, followed by forty-eight on reaching Aydincik, day two. Day three was certainly the hardest sixty miles I had ridden for quite some time. As I rounded the southernmost tip of Turkey’s Mediterranean coastline I was met with strong winds to accompany the endless peaks and toughs creasing the rocky landscape. It was stunningly painful yet beautifully exhilarating, a bit like being kissed and punched at the same time. I arrived into Kizkalesi (I think!) burnt from the sun, brow beaten by the wind, exhausted from the hills, but alive with adventure. A rare stretch of flat road between hills. Plastic tunnels covered the landscape – prime growing land; bananna’s, strawberries and a variety of vegetables. I aim to reach Erzurum on the twenty-sixth of February to receive a Visa before the consulate closes for a religious holiday. A daily average of fifty-two miles is required to be there on time. I had hoped to take advantage of the lower ground to put some miles in the bank, however, the road and the wind do not yield to human endeavour, we must yield to them, and still find a way. 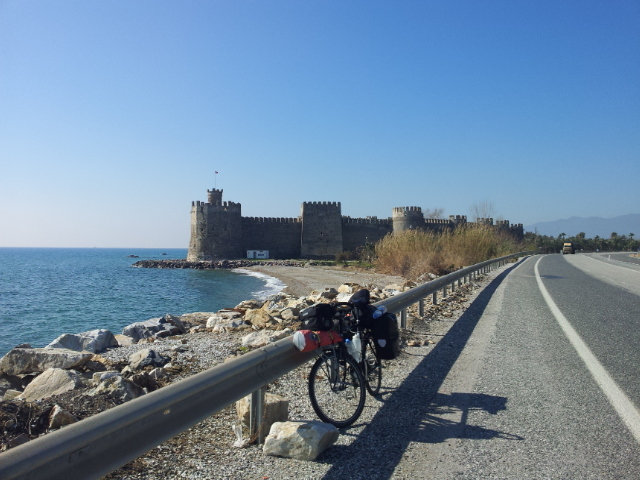 Leaving Kizkalesi, the road now gently waving up and down much like the sea to my right, the wind incessantly beat upon me. Dogs line the road where buildings exist; their barks pierce the constant, all-consuming gale assaulting my ears. Helpless surrender is the only defence I have; crawling past like a sedated snail, hoping not to be eaten, I continue. The road around the coast was spectacular. Ear to ear grins briefly emerged between steep climbs of sweat drenched over exertion. The wind relented as quickly as it had asserted. 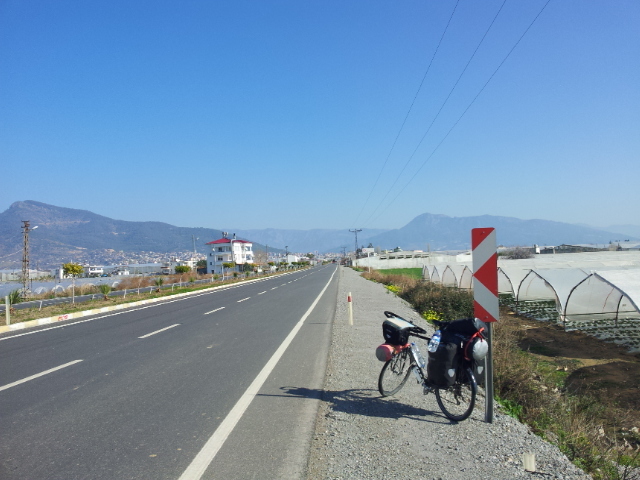 Without complaint I pushed on through Erdemli to reach Mercin, where I stopped for lunch. Despite the windy start, I had mustered a solid thirty-three miles in three hours, and, with Adana calling, I sensed an opportunity to eat some miles. A castle! Haven’t seen many of these. As I travel east, Turkey is changing. The coast attracts tourism, and tourism waters down the culture, smoothing off the rough edges to cater for the needs of the visitor. It’s a vast country; the further east I travel the less the culture has been diluted by tourism, and the more interesting it becomes. Travelling by bicycle invites interaction in a way no other mode of transport does. People feel entirely free to shout at you from the curb, a building site, a school, a passing vehicle, from anywhere they please. It’s like the bicycle is a symbol of free speech, no, of active expression of speech. It brings down barriers in a wonderful but sometimes intimidating way. The sea is covered in white ripples caused by the wind. The landscape offers little other evidence of the wind. Adana is a major city, and arriving at rush hour on a Friday, through major road works, added a noticeable shot of urgency to the driving enthusiasm of the commuters. The feel of a big city, even after a long day on the road, never fails to stimulate full attention and involvement as the flow sweeps you up and eventually spits you out. If you are lucky you end up where you were heading, if you are stupid (like me), you don’t know where you are heading, so end up in the middle of nowhere. ‘Nowhere’ is cheap though, and I’m grateful for that. I found an old, traditional building which had been converted into a hotel. The room had been butchered (with studded walls) from what I imagined to have been a space of grandeur in it’s day. The whole building reeked of stale cigarettes, and there was no escaping it. 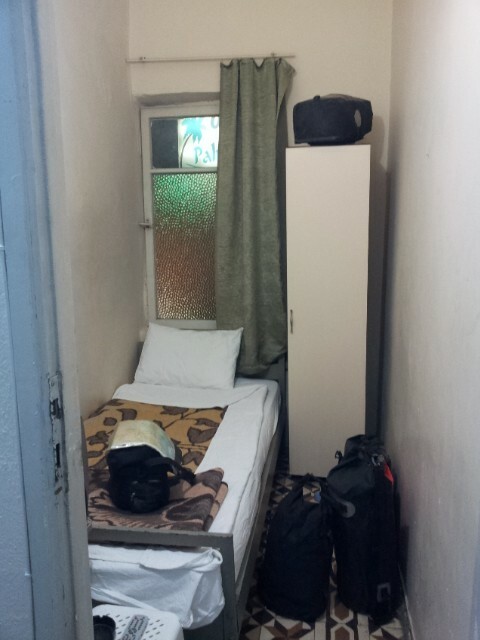 This is the smallest room yet, but significantly better than errecting a tent in the city centre. 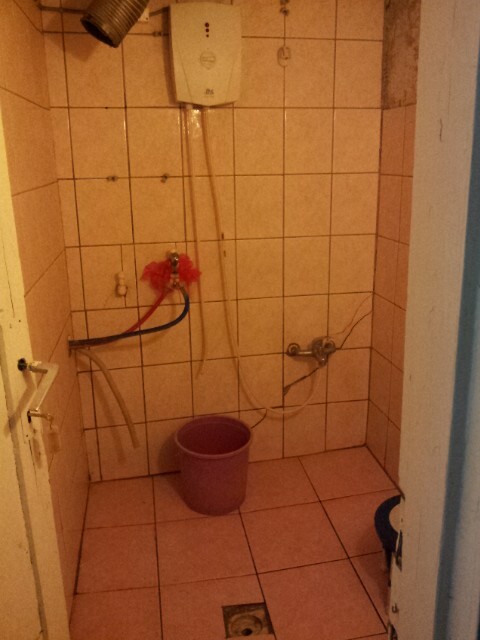 The communal shower was hidden on an outside landing, although it was more of an electrically heated hose than a shower per se; this place had character. The old chap from reception demonstrated how to use the ‘shower.’ Sit on the stool, fill the jug of water (sitting in the bucket) and pour it over yourselve. Repeat with soap until clean. The toilet was a unique experience too. I haven’t written this to chastise the hoteliers or even in complaint of the standards, I write to celebrate it. It was unpolished, but everything was clean and worked perfectly. More than that though, it offered a window into life in that part of the city. I freshened up and wandered out to find food. Quickly drawn like a moth to the flame, I zeroed in on a backstreet vendor with customers sitting outside; usually a good sign. 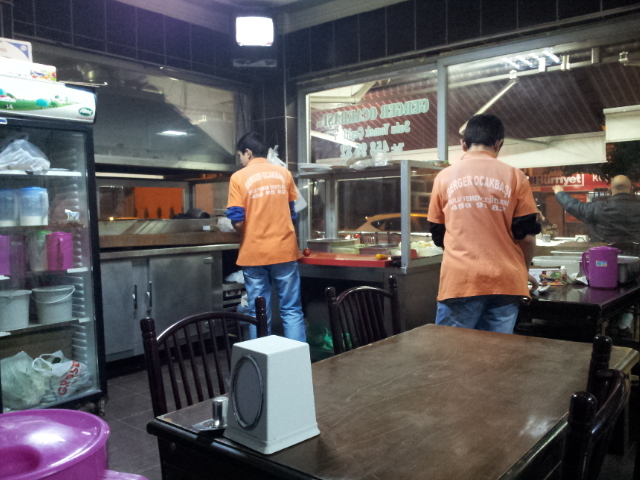 Greeted by a young chap of twelve years I said ‘Yemek alibilirmi yim , lutfen’ (I would like food, please. My Turkish is like the hotel; unpolished but effective). He showed me a mixture of different skewered meats from which I selected. I was then amazed to see a second, younger boy arrive to set my place and take my drinks order. This pair rustled up a feast fit for a king without an adult in sight, all for the touring cyclist friendly sum of three pounds – amazing. The chap in the background did the chopping and cooking. He had some seriously impressive knife skills. The ride to Adana and the indirect route hacked through the inner city to my palatial suite had registered ninety-five miles on my odo. The following day was met with a sort of stunned vacancy; my legs (and bum) had not recovered fully overnight as they normally do, and my head felt like it had been squeezed in a vice and exposed to heat whilst I had slept. It was adjustment pains, as my body had absorbed greater stimulus and was becoming conditioned to process the additional inputs. Uncomfortable, all the same. 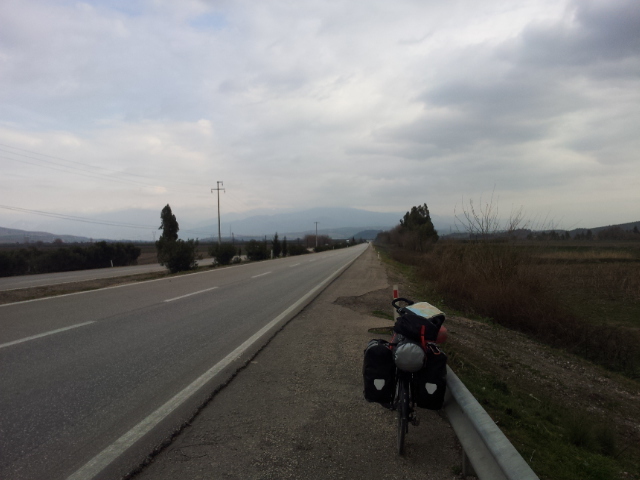 The winds returned, and I cycled on towards Osmaniye mainly in pain, although encouraged by the flat road ahead. Osmaniye was even more remote, raw and interesting, and only fifty miles from the Syrian border, with a substantial mountain range separating the two. From Osmaniye, I start heading north east through Pazarcik, Malatya, Elazig and Bingol. I could have taken the same photo at any point between Adana and Osmaniye and it would have looked the same. What I know about what lies ahead is that the roads will be higher, the temperatures will be lower, the people will be less familiar with westerners, and the cycling will be tougher. But it is the adventure of travelling towards the unknown that, in itself, offers the greatest reward. ONWARD! I really enjoyed reading this post. I think it’s probably my favourite to date. I can really feel your thirst of adventure in your words. I’m glad to hear you are finally back on the roads too and that it’s going well. I hope the weather won’t be too cold for long. I’m glad that’s who you are! I had grown to know you through the electronic highways and the alias confused me. I look forward to your next post with anticipation.